The World Resource Institute (WRI) state in a recent report that catering businesses should use digital tools to tackle food waste. 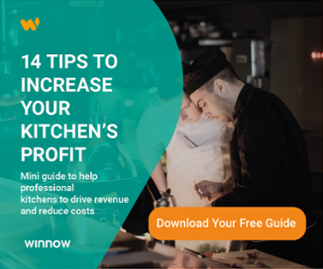 This is the first time the WRI have specifically recommended that digital tools are needed to tackle catering food waste, and use Winnow as a best-practice solution. The findings in the report, produced in association with WRAP, is part of the Champions 12.3 initiative that oversees progress against the SDG goal of halving food waste by 2030. In the catering business alone, food waste is a $100 billion annual opportunity. The report represents the WRI's most in-depth research to date, analysing pre-consumer waste data from 86 catering sites in six countries. The research finds that for every pound invested by catering firms in reducing food waste, an average of six pounds is made back over three years. This handsome return prompted the WRI to ‘encourage managers in this sector to start seriously exploring what they can do to reduce food waste and reap the benefits’. The business case for using digital tools is clear; it is now a matter of execution. How does the WRI recommend caterers tackle food waste? One of the leading recommendations for caterers is to begin measuring food waste. The report uses a phrase that is much loved at Winnow: 'what gets measured gets managed'. Measurement is key because from the very beginning it both alerts staff of the scale of the challenge and crystallises the business case for management. With management support, caterers are then empowered to set targets to reduce their waste and work together to achieve the target over time. For many catering businesses running tight margins, reducing food waste can be the difference between a profitable or loss-making business. This report states that caterers achieved, on average, a 36% reduction in food waste in the first year. This figure climbs to 44% after three years. Which Winnow client is used as a case study for reducing food waste? It is a testament to Winnow's progressive and resourceful client base that the WRI cited one of Winnow’s oldest clients, the international catering firm Compass Group. On average, Compass sites that use Winnow have been able to reduce food waste by 50% over 12 months. Measuring food waste using digital tools to ensure the data is accurate, with the information then sent to chefs to enable adjustments in production. Engaging kitchen staff was key to the success of the Compass programmes. Internal communication was a high priority, with an emphasis on staff understanding the rationale behind the program and its benefits. Beginning with a few key sites. Compass began working with Winnow in 2013, and initially installed the system in a select number of sites to test the business case. Once it was proven, they rolled out the technology at scale. This Champions 12.3 report is key if the catering sector is to have any chance of meeting the target of reducing food waste by 50% before 2030. It demonstrates that food waste programmes don't only make environmental sense - they make financial sense too. For caterers who adopt digital tools now, they could even meet the reduction target by 2020. If managed properly, there should be no reason why caterers everywhere cannot significantly reduce their food costs, taking advantage of a 6x return on investment in measuring food waste. Choosing digital tools over manual data input is a key component in achieving this return.